Another verrines directly inspired by this book. 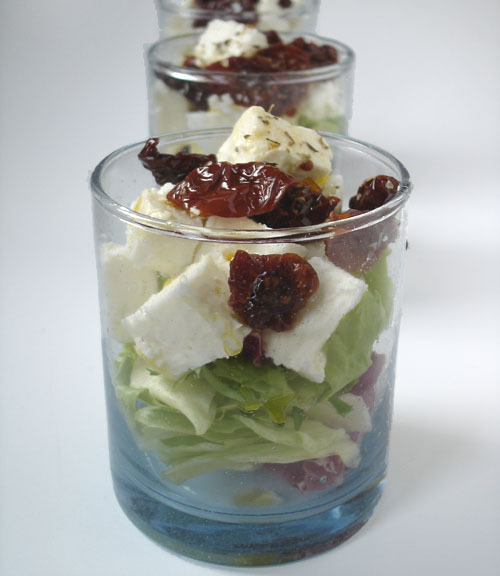 It’s like a verrine in kit: I did absolutely nothing if not cutting the feta cheese and assemble everything! Cut the feta cheese in cubes. Assemble the glasses beginning with the salad then feta, then the tomatoes. Drizzle with oil and season with oregano. Note: Pachino’s Tomatoes are little cherry tomatoes that grow in the field around the Sicilian town of Pachino, in the far south of the island. They are sweet and tasty, very rare and expensive… We bought a kilo of dried Pachino’s Tomatoes last summer, at the Siracusa market: they are worth every cents we paid them!! !